carry on carry on about our trip to singabore as some people like to call the lion city. 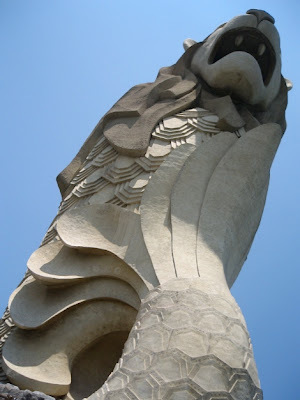 and speaking of lion, here's the merlion, a newer, taller replica of the original back in the main island, the one that spouts water out of its mouth. a merlion is another breed of mermaid or merman, and believe it or not, they even have mercubs! sentosa is a resort island, which singapore developed and is continuing to develop as an all-family, all-the-time destination. it's connected to the main island by a bridge. and if you don't have a piece of paper confirming your reservation at a sentosa hotel, you have to pay the toll of S$2 per person. which we did because we had no such paper. sorry ha di namin kasalanan, 'di kami binigyan eh. but the hotel will reimburse you for it just in case THEY FORGET. but for all the gastos for every little thing, the island has a fleet of hop-on-hop-off buses that you can hop on, hop off for free! so we took advantage and semi-toured the island at sana pumayat, at hindi kami umitim.... because it was hot! unlike manila, which has been raining and raining tama naaaa! 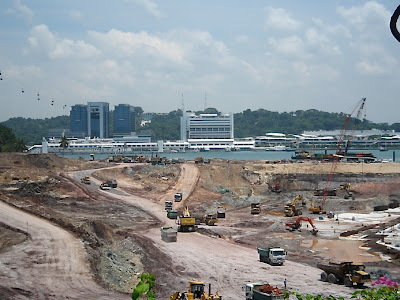 check out all the construction going on in the rest of sentosa island: more hotels and more family-amusement venues being built. haaay, sana some rich dude had the foresight to do this in the philippines, and to look beyond his lifetime! tomorrow, let's go shopping!